I've always liked miniatures, they're well... compact. So when Bandai decided to charge more $$$ by including figures that most people don't care for, I was happy about it. Then of course, we all know what crappy plastic it was cast in - those rubbery, impossible-to-sand material. I guess it's because they need a low density, vinyl-like plastic so that they can still do injection given the amount of details these figures must have, because styrene can't capture that kind of detail, and resin is too expensive. So far I've managed to work through the material, and it does have some advantages over harder plastics, so here is an article on making the Ramba Ral & Crowley Hamon figures. If you're unfamiliar with application of some of the tools, the how to build GK article has more information. Well I lied, part of this article works on Quatre. 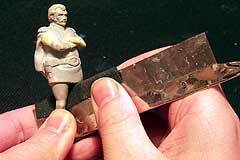 First, most of the figures are in one piece, so the job is to remove the flashes and seams on the figure. You can use a very sharp knife to trim away raised seams. 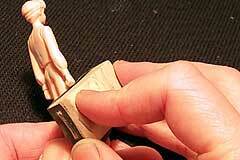 Be careful though not to trim away too much; you can practice on the sprue first. 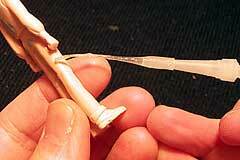 If your figure requires assembly, use superglue to glue the parts together first. The trimmed area is very uneven. If you manage to create a more-or-less smooth surface you can skip this step. Otherwise if your surface is very rugged, apply a thicker superglue (such as zap-a-gap or even slow-zap) on the surface. Don't flood it, apply one layer at a time, and use superglue accelerator to speed up the process. Now use a 220grit sand paper to wet sand the surface to smooth it out. Make sure you try as much as possible smooth out the edge of the super glued area. You can then use a 400grit to smooth out the area if you want, but it's very hard if the area is not superglued.These plastic don't take fine sanding well. I usually don't do this. There are quite a few circular injection "sink holes" on these figures, I use Mr. Surfacer to fill it, and sand smooth with 400grit sandpaper. The areas between legs are very hard to sand. You can first trim the seam, and here I use a hand saw wrapped with a piece of 220 grit sand paper to remove the left overs. Here Ramba has been primed with Mr. Surfacer 1000. Priming lets you check progress on the figure (who can see what's going on in that skin-colored plastic), and lets you paints stick better. I prime extra layers of primer on areas where the seams are used to be, or around scratch marks. Then you can sand those area smooth with a *used* 400 grit sand paper. A new 400 grit is too coarse and can scratch off the primer very quickly. Then reprime. I usually iterate 2 or 3 times. Then I put on the base skin color first with an airbrush. You really want the skin layer to be smooth. Since I wanted to do a transparent effect on Crowley, I also painted her other parts with the skin color. On the right I gave her a lingerie and misted a layer of thin color for her tight pants. The paint I use for basic colors are Gunze's Mr. Color. I pryed Crowley's sideburns away from her face (see Advanced Topics). (Left) Next I masked her face and pants and put a layer of clear dark purple, mixed with smoke+clear red+clear blue. You have to do it by layers so that the skin will show through, but enough so that the lingerie looks like it's covered by the outer layer of clothing. In retrospect I should've painted the lingerie with a less intense color such as grey, because it makes it easier to achieve this effect. (Right) After that, I use a paint brush to draw in the details such as her scarf, belt and hair. Ramba Ral with most of the basic color in. (Left) I airbrushed his face, yellow and red, all of which are less opaque color (more difficult to handbrush) that can benefit from airbrushing. Also because they are so separated you can airbrush these colors without masking. (Right) Then I handbrushed his uniform, hair and boots. After finishing the belt (not shown here), I hit the figure with a layer of flat coat. This makes using artist oil later easier, because oil doesn't grip well on a glossy surface. Instead of black, I use Navy Blue as a substitue so that the figure looks more natural. After I'm done with laying the basic color, we need to add constrast to the figure. The paint shown here is artist oil on palette (left) and some cold wax (right). The latter gives you control over consistency of the oil. The middle is a Bunseido brush, it's the best detail liner I've tried, you can buy it from Rainbow 10 . (Left) The shadow colors are dry brushed with oil onto the face. Sometimes they're a bit patchy. (Middle) The patchy spots are blended to give a more natural gradation. (Left) Highlights are added in the same dry brushed manner. ( Right 2) The highlights are blended, and I inked in his eyes. I also drybrushed light and shadow for Ramba's hair. To give him more age, I drybrushed streaks of titanium white on the highlight and his moustache. Crowley was given similar treatment, though her shading is more subtle. (Left) Crowley with shadows laid in, and some groove shades for her hair. Eyes inked in too. (Right) Small highlights and blushes were applied, as well as her lips. Highlights for her hair. Another way to use oil is to lay in the shadow colors first, then blend, instead of drybrushing them on. Here the blue streaks on the left are is shadow color (ultramarine blue + little black), wait for it to sit around 5-10 minutes, then blend. The result is shown on the right. Crowley almost finished. More shading was done to her clothing. Also inked in some places to give contrast, such as between her legs and arms. These areas will be blended so that they look more natural. More touch ups, such as shading Ramba's legs, cape, belt and painting his boots. The navy blue is supposed to be semigloss, but it turned out really shiny. I then fixed both on clear acetate sheets using superglue, and here they are! You can see more images here. The MG figures' pose are quite boring - tense indivdual standing straight, staring at nothingness. Here I change Ramba Ral to a folding arms pose. First I amputated him - cutting his arms off was not too hard with these plastics, but be careful not to miss and cut off too much. If you're good or lucky you can get a pretty smooth surface for the cape, but I'm neither, so I neede to smooth out the rugged relief with polyester putty. In fact my armature here wasn't accurate at all, his arms were too low, I fixed them afterwards. 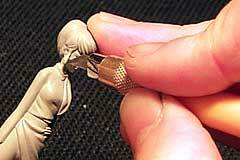 After creating the armature, glue them in place with superglue and after it dries, polyester putty was applied on top of the armature. Polyester putty Mori Mori was great for cutting and sanding, so I sculpted the arms using a knife and sandpaper. If you think you almost got it, prime and check and re-sand. Here I've corrected some problems and is almost done with the arms. An advantage of these crappy plastic is they're easy to cut and are flexible. What I like to do with them is cutting the hair so that they're flying away from the body; this alone gives your figure increased details and minor pose dynamics. Here I'm separating the sideburns of Crowley from her face. This requires a very sharp knife, a steady hand and a lot of careful guess work, because you don't want to actually cut away the hair, only pry them away from the face. I did the same for her front hair too. You can also avoid the static pose by changing the focus of the figure by moving the head. MG figures are usually quite easy to decapitate because they have a neck line. I did this change for Norris Packard. 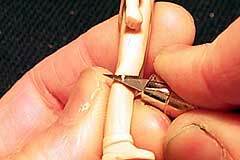 You need to drill a hole in the head and the body and use a pin to connect them, otherwise simply gluing the head to the body may result in the head breaking off easily.